Baseball season is over, but R.A. Dickey is just beginning an eventful few months. In January, he's set to climb Mount Kilimanjaro to benefit Red Light District Outreach Mumbai, which combats human trafficking in India. Then, in March, he’ll release his memoir, Wherever I Wind Up. Dickey spoke with The Sports Section about New York fans, preparing for his climb, and tossing knucklers at 20,000 feet. You’ve said that Ernest Hemingway’s The Snows of Kilimanjaro inspired your climb. That book’s main character regrets his entire life and dies of gangrene. What about the story made you want to climb the mountain? The scope of the mountain resonated with me. It wasn’t necessarily the plot. I read the book in eighth grade — when, of course, you don’t have the means or wherewithal to tackle something like climbing Mount Kilimanjaro. I always thought it would be a fantastic pilgrimage to hike to the summit. For years, I — the way that we do — we file things in our minds, in cabinets deep in the recesses of our brains. And then it just came back out. I’m including a couple of friends in the climb: Kevin Slowey from the Minnesota Twins and Dave Racaniello, the bullpen catcher for the New York Mets organization. We’re going to the summit, Uhuru Peak, which is a little under 20,000 feet. Do the Mets have concerns about this? Yeah. I’m a grown man, and I can do what I want to do. But at the same time, let’s say I slip, fall, break my leg, and can’t pitch for two months. Legally, they have the authority to void my contract. They’re not saying that they would exercise that right, but they wanted me to be informed. Although, on paper, the climb seems like a fantastic thing to get behind, it’s been tough. They view it as a dangerous thing. Of course, it’s a risk I’m willing to take. I know what I’m doing well enough to know it’s nothing more than a glorified hike. There are no technical climbing skills involved — it’s not like Everest or K-2 or Fuji. So I’m not real worried about it. Still, it could be tiring and hard to breathe in the thin air. How are you preparing for the physical challenge? I’ve done some triathlon training over the past two-and-a-half years in the off-season to get ready for Spring Training. Outside of that, I have an altitude training mask that I can work out in, sleep in, walk in. It emulates, let’s say, being at 10,000 feet, and there’s a nozzle that you screw on that emulates being at 15,000 and then 20,000, and so on. But I won’t be going to any high altitudes to train. I don’t have the time. I’ve got a family of four, and I’m gone so much anyway. You’re bringing a bullpen catcher to the summit. Will you test whether a knuckleball will move up there? [Laughs]. Well, I already know the answer to that. I need real thick air. So I’m not even going to attempt a knuckleball because I’m afraid I would embarrass myself. At the summit, it’s just not going to do much. Hopefully, I’ll be able to breathe up there, much less throw a knuckleball. So you vote “no” on the Mets moving to Mount Kilimanjaro? Yeah. A big, fat “no.” No matter how far the fences are. You’ve become a fan favorite. 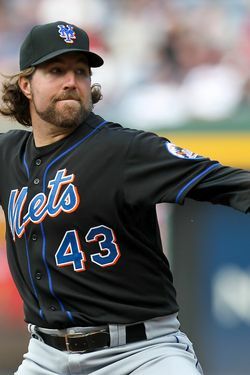 Amazin’ Avenue had their R.A. Dickey Face contest, for example, and you have an online fan club: the R.A. Dickheads, whose motto is “Let he who is without ulnar collateral ligament cast the first pitch.” Does the response you’re getting here have to do with the nature of New York itself? I want to temper my comments with this disclaimer: I’m not going to say that the other cities I played in weren’t cosmopolitan, or clever, or witty, or bright — because I’m sure there were droves of people there who were all those things. But when you come to New York City, you have such a melting pot of different people and cultures and ethnicities that you don’t have to worry about being yourself. The fans are really representative of the city as a place that can be so open-minded and embrace something that may be abnormal. And I’ll be the first to admit that I represent an abnormality as far as baseball goes. I’m old enough to say I don’t feel bad about it; I’m comfortable with who I am. But there was a time in my career when I probably wasn’t. I was mindful of the things I said, or how wide open I would be in an interview, or how much of the truth I would reveal. But in New York, I feel like all those things are appreciated, and I’m thankful for that. You became a knuckleballer later in your career, but it seems like a perfect fit for your personality. Has the pitch changed you at all? I do feel like it’s a perfect match. That’s really been a big blessing in my life. It’s difficult to leave who you were behind and embrace being someone totally different. In my career, that’s what I had to do. There’s a lot of fear surrounding that, so I would say the journey to becoming a knuckleballer has changed me dramatically. How has that change manifested itself? As a conventional pitcher, I always felt confined to having to hit corners of the plate. When I took on the knuckleball, that went out the door. You don’t command the knuckleball. You just let it go. You’re not bound by the laws of pinpoint control and pitch sequence, because every hitter knows what he’s getting when he comes to the plate: knuckleball, knuckleball, knuckleball, knuckleball. So it frees you up to just be you. When I throw a perfect knuckleball, it’s not like any other sensation I’ve ever experienced in baseball. You let it go, and you know you’ve thrown a good knuckleball, and it’s just kind of opposite the turning of the earth. It’s a real kind of feeling. Knowing you don’t have control over something and being okay with that is a really freeing experience. Have you evolved off the field, too? Certainly. When you’re younger and you’re playing with the likes of Alex Rodriguez, Mark Teixeira, and Michael Young, you don’t feel like you have any ownership. You don’t feel like you have a voice. It’s the superstars’ team. That’s not necessarily the way they wanted it; it’s just the way I felt. A lot of times I would have things to say that I wouldn’t say. I would be afraid to connect with another player because of what he might think about who I was or what my passions were. Would it get back to the front office, and would they think I was so quirky that they wouldn’t want anything to do with me? You play all these games in your mind as a young ballplayer hoping to stick in the big leagues, and you kinda lose yourself in that, you know? It’s a real lonely place. At least it was for me. Of course, not everybody is as philosophical about things as I am [laughs]. A lot of people probably don’t have the thoughts that I’m voicing to you right now, but I certainly had them. And the older I got, especially when I started to embrace the knuckleball in my mid-thirties, I had to adopt this “I’m gonna do what I want to do, and I don’t care what you think about it” kind of mentality. It was a real moment of freedom for me when I embraced who I was with the pitch. I knew it was a quirky pitch, I knew it was somewhat eccentric, I knew there were very few people who could do it well, and that was okay. I was gonna be me.